Delirium Café is a sprawling complex of just short of a dozen separate boozy venues. While some of them play with liquors and cocktails, most focus on beer. The original café was downstairs just off the most touristy restaurant street in Brussels. They added a draft house with several dozen beers on the ground floor and more recently opened the “Hoppy Loft” on an upper floor. The Hoppy Loft is a bar for beer connoisseurs. 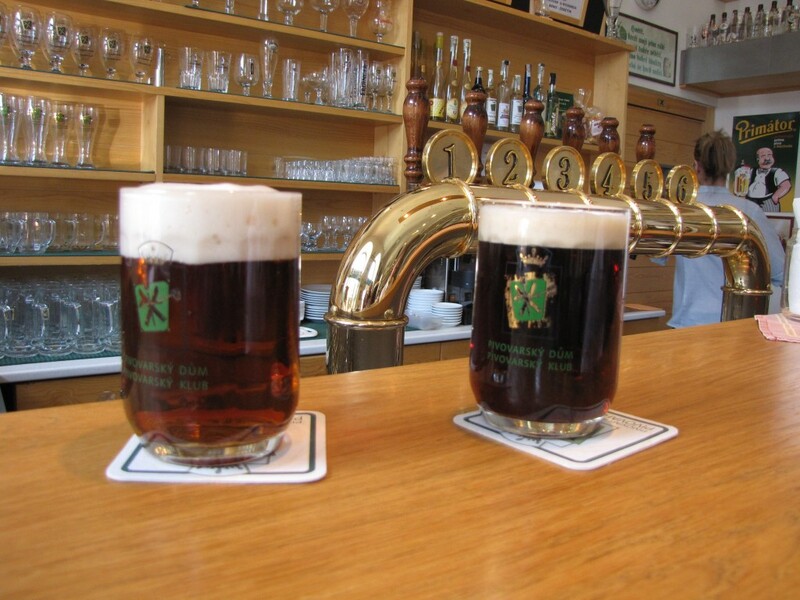 Featured beers are hard to find, with exceptionally high quality and prices to match. Some of the bar staff we’ve met there have been among the most knowledgeable of any we’ve encountered in Brussels. In the summer it’s hot, but rarely as crowded and noisy as the mob scenes on the lower floors. It’s a place we never miss when we’re in Brussels. And when I’m drinking this and realizing those monks aren’t ever going to get any, I’m sodding glad I’m not one of them. Tasting notes: a green bottle gave us pause, but the barkeep assured us it was in good shape and he was right, as usual. A rich dark raspberry filled the beginning with cherry stems coming along for the ride and some late wood barrel complexity. It continued rich and fruity with a long aftertaste. A touch of funk, of course– it’s a Mikkeller out of the box powerhouse– but it’s smooth enough to get past Ellie’s sensitive acidometer. I have a great deal of respect for Mikkel Borg Bjergsø. He and I have both spent a great deal of our time in classrooms teaching school. We both really like beer. 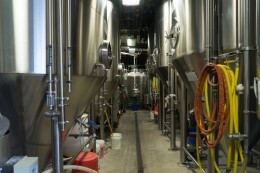 We both established award-winning contract brewing companies and set new standards for brewing. There’s a huge difference between us, though. I took the safer path—and also the more family compatible—and, when a choice became necessary, took the classroom over the brew house. Mikkel went all in for the beer, moving beyond his early base at De Proef in Lochristi, Belgium, he’s brewed hundreds and hundreds of different beers at other people’s breweries all over the world. His several beer bars in Copenhagen are among the best in an excellent beer city and he’s opened more all over the world. His several beer bars in Copenhagen are among the best in an excellent beer city and he’s opened more all over the world. But Mikkel (no one ever seems to refer to him by his last name), has gone far beyond his original Danish roots. He’s opened up Mikkeller bars not only in Europe (Berlin, Stockholm, and Barcelona), but Asia (Seul, Bankok, and Taipei) and, at last, a major push into the United States. In 1913 he opened Mikkeller SF, a taphouse and bar in the Tenderloin district of San Francisco. A couple of years later he partnered with Alesmith to open his first physical brewery. Alesmith one of the great early West Coast pioneers, was moving to a facility capable of brewing ten times as much beer as the original 25,000 bbl. brewery. That original Alesmith brewery is now Mikkeller Brewery, San Diego, pouring out a wide range of regular and one-off beers. Mikkel is still traveling and producing contract beers all over the world, but he spends enough time in SD to welcome many of his brewer friends to collaborate on his home turf. Warpigs serves house brewed beer and American BBQ in a typical Mikkeller “lets get to know each other” atmosphere. Any beer tourist who hasn’t visited at least a couple of his bars and taprooms isn’t trying. Mikkel doesn’t run all the good beer spots in Copenhagen, but he’s now the largest part of the exciting beer scene there. 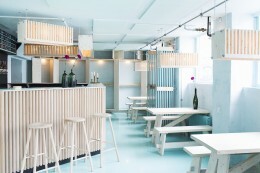 His original bar is at Viktoriagade 5, an easy walk from the main train station. Mikkeller and Friends is in the Nørrebro section of Copenhagen, an easy bus ride from the center and then a few blocks walk down Stefansgade to number 4. (More details about these places are in our book.) On your way, pay a visit to the Nørrebro brewhouse, one of Copenhagen’s brewing pioneers and still one of the best places to find local dishes and good fresh beer. (Bring money, and if you’re really on a budget you should be in Barcelona, not here.) An easy walk from the original bar can take you to Warpigs, a joint venture of Mikkeller and Three Floyds of Indiana. An American chef turns out authentic BBQ which you can wash down with close to two dozen different beers. Most are brewed on premise, but there are a few Mikkeller guests. 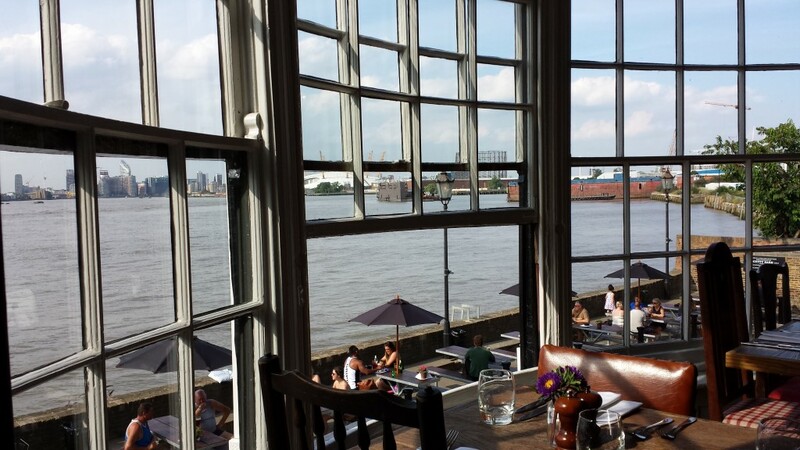 Mikkeller’s Barrel Room sits on the water across from the Little Mermaid. 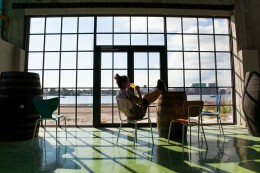 View from Mikkeller’s Barrel Room beer bar and education center in Copenhagen. 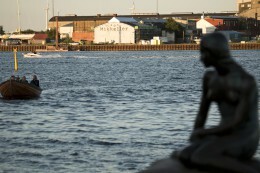 Last June in Copenhagen, he opened the Mikkeller Barrel Room on the water on Refshaleøen, an annexation to Amager that used to be a stand-alone island with industries that included a shipyard that included a shipyard employing 8,000 Danes. The Barrel Room not only serves barrel-aged beers, but serves as a small museum, educating visitors in the nuances of barrel aging. It’s not central, but the 9A bus from Tivoli gets you within a 10 minute walk in fifteen minutes. Note that it’s normally open only on weekends in the summer. We visited the Mikkeller bar in Barcelona last summer as part of the research for our second book, which will show travelers how to find very good beer in tourist destinations where they don’t expect it. Barcelona has a dramatically vibrant craft beer scene. We sacrificed seeing most of the tourist sights to try to make it to all the important beer sites. We fell short despite allotting several days to the task. Mikkeller is easy to visit, however, and a stone’s throw from many of the towns best bars and breweries. 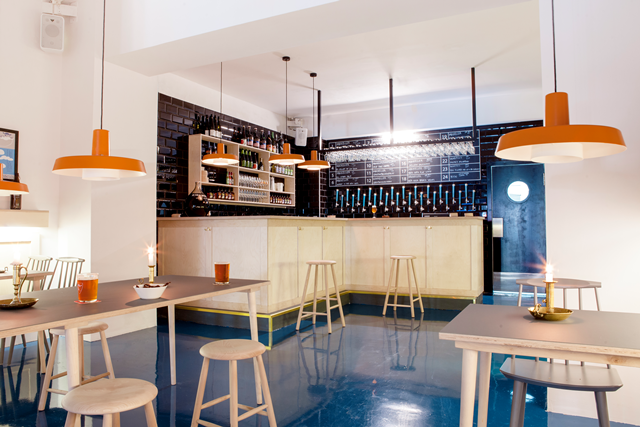 Mikkeller’s bar in Barcelona is an unmistakable Scandinavian immigrant to Spain’s most vibrant brewing area. For a giant international presence, the Mikkeller bar was somewhat understated. 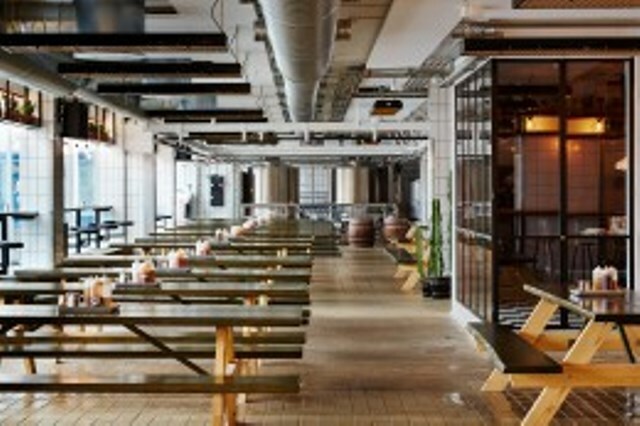 When Mikkel designed the Mikkeller and Friends, he consciously tried to create spaces where couples and groups could meet and talk, but that also facilitated conversations with the group next to you. That theme has carried over in his other outlets. ** Barce Communal tables and lots of open spaces make it easy to strike up a conversation with someone next to you. We were there on a weekend and it was a good deal less crowded than we expected. The light crowd allowed us to have a good conversation with the bartender — who was as knowledgeable and interested in beers and the brewing scene as one would expect. Mikkeller seems to be a bit of an odd man out in Barcelona, where the main beer focus is intensely and loyally local, but the Mikkeller bar is testament to the vibrancy of the city and adds some nice breadth to a beer crawl there. We had a chance to try our first beers from Warpig there—look for a review of one brewed with a “mash pit” of 93 different yeast cultures. Amazingly, it worked out well. We’re waiting for Mikkel to find the East Coast of the US. His beers are easily available here, though often pricy and not always as fresh, though sometimes that really doesn’t matter. 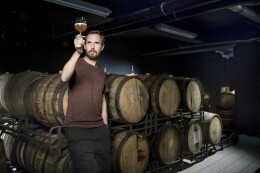 In the meantime, “Just Go” find some Mikkeller beers from a part of his growing empire. It isn’t hard. Overview: I have a great deal of respect for Mikkel Borg Bjergsø. We are both school teachers who love beer. He, however, has yielded the classroom for full time campaign to bring really interesting beers to all parts of the world. We’ve visited many of his bars, but he’s opening them faster than we can travel. 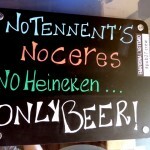 SEE OUR “BEER OF THE DAY” THIS WEEK FOR SOME REASONS TO GO TO ITALY THIS SUMMER! 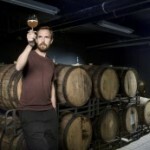 As noted in our main blog post this week, Mikkel, of Mikkeller, has brewed all over the world. He got off the ground, however, at the Flemish brewery of De Proef in Lochristi, which describes itself as a “brewery for rent.” Theirs was a brilliant concept, and while De Proef has brewed some of its own beers over the years, it has brewed literally thousands of distinctive beers of for beer restaurants, fledgling breweries and even some established breweries that wanted to play with someone else’s’ toys to make especially funky Belgian beers. 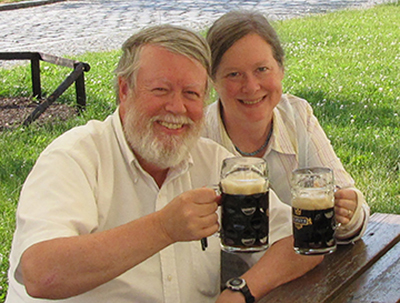 CAMRA’s Tim Webb, one of the world’s foremost experts on Belgian beer, once complained that the De Proef beers were too numerous to really evaluate effectively, but too high quality to dismiss. It was a perfect incubation venue for Mikkel to crank out the dazzling array of beers that has the the hallmark of the Mikkeller brand. With batches as small as ten hectoliters, he could take risks that bigger breweries couldn’t even consider. Once he opened his bar in Copenhagen, he had a brewpub-like outlet for one-offs and out of the barrel unique brews. Today we highlight a beer he brewed at DeProef in 2010, Nelson Sauvignon Single Hop Ale. Nelson Sauvignon was a difficult to obtain hop a decade ago, and it achieved something of a cult status before produces were able to respond to the unexpectedly high demand. The hops lends itself well to single hop beers: it always manifests a white-wine grapeyness, but depending on how it’s used it can also include some melon, lemon and a bit of not-too-excessive grapefruit. Here, it’s on full display in all its glory. A later version, part of Mikkeller’s single hop IPA series around 2009 toned it down a notch and cut the alcohol from 9 to just under 7, but they took no prisoners in this double IPA version. We tasted in on draft at the Capitol Ale House in Innsbruck, Virginia, just outside of Richmond. Tasting notes: Full malt with a huge hop presence that includes more grapefruit and pineapple than you usually get with Nelson. Slight sugars in the malt, but the big malt is necessary to support the shiploads of the Nelson. ON MONDAY WE’LL FEATURE SOME ADDITIONAL HOME RUNS FROM MIKKELLER (AND SEE OUR “HOPPING AROUND” POST THEN FOR MORE ON MIKKEL’S IMPACT AROUND THE WORLD. This is another from our all-time favorite list. We encountered it in 2006 not long after the Chainsaw we reviewed yesterday. A decade ago brewers had fewer hop choices; their skill in mixing and matching often determined the success of a beer. In an earlier review, we noted “Any brewer can make an extreme version of the style if he’s willing to spend the money, and a good brewer can do a good one pretty reliably– the huge hop character and big malt base cover up a world of minor miscalculations. But a really drinkable Imperial IPA is hard to brew,” and went on to note how despite the hops, the brewer had achieved balance. But a great double IPA doesn’t require balance. Sometimes greatness just emerges from the purity of the hop and the skill involved in using the hops in the right way. 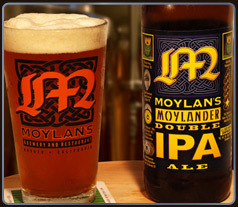 Moylan’s Moylander Double IPA doesn’t even pretend to balance, but it is a truly exceptional beer. Even Ellie loved this unbalanced beauty. THROUGH SATURDAY APRIL 15 WE’LL FEATURE A FEW OF OUR FAVORITE DOUBLE IPAs OF ALL TIME. 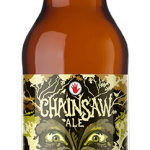 Left Hand Chainsaw Ale Double Sawtooth Chainsaw Abv 9.4 IBUs 58? Ten years ago, the double IPA craze really seemed to take off. The following is a beer description that we wrote in 2006. Left Hand still cuts to the quick in brewing top rank hoppy beers. We’ve had more double or “Imperial” IPA’s in the last three weeks than we’d had in our whole lives. 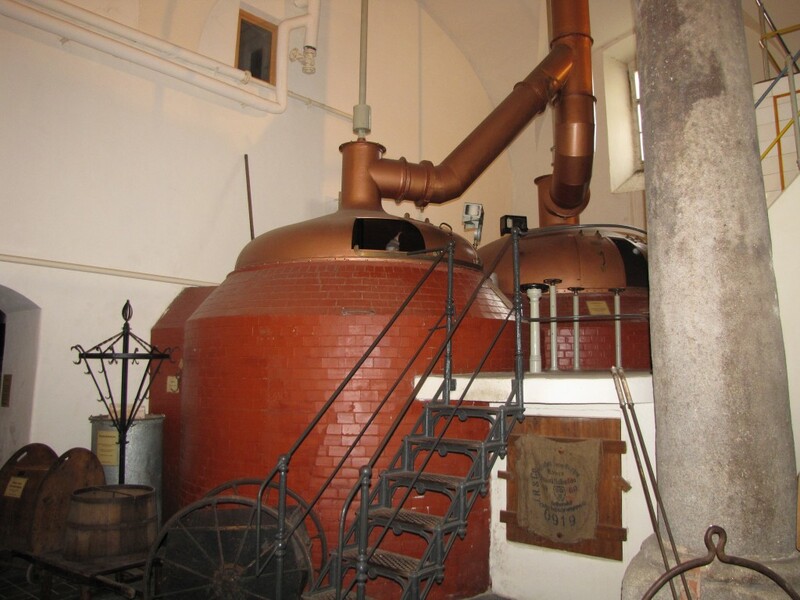 Any brewer can make an extreme version of the style if he’s willing to spend the money, and a good brewer can do a good one pretty reliably– the huge hop character and big malt base cover up a world of minor miscalculations. But a really drinkable Imperial IPA is hard to brew. One of the best we’ve had lately is from Left Hand Brewing Company in Longmont Colorado and it’s distributed on the east coast. Tasting notes: A base of deep malt evident even in the aroma sets the stage for lots of sweet hops and a long hop bitter. Nicely complex, with hints of wood and some raisons and maple as it drinks. No one’s going to drink a 6 pack of this 9%er, but it is one you can play with over the course of an evening.